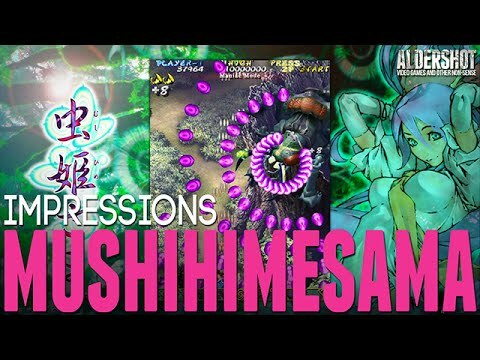 Mushihimesama is an arcade classic Shmup (Shoot'em up) from 2004 by Cave Interactive, a studio well known for their bullet hell games. Mushihimesama seem to live up to Cave Interactive's reputation, as it features some of the most bullet's I've seen on a a screen at once. Reflex based gameplay is the highlight here and your skill as a shump player will absolutely be tested. Having so much bullets on the screen the developers have done something very smart, and only a master of the genre could come up with. Make the character's hitbox smaller than the character model itself. The hit box is only about the size of the character's head. You may say "but that doesn't make sense, and would only confuse the player", but the reality is, in a good shmup, the player never looks directly at the character itself. Rather, the player will use his/her peripheral vision to track the character while paying attention to on coming dangers, almost like using a sixth scent. By designing the hitbox this way, it allows the peripheral vision to easily follow the character, while "feeling" their way around the bullets. It's simply brilliant and intuitive design on the part of the developers. Aside from the hitbox design, the bullets are large, flashy, and purple and clear. There are no other purple elements in the game besides the bullets, which also adds to the excellent visual clarity of the game. The bullet's formations are also unique to Mushihimesama, beautiful at times, and most importantly, challenging and satisfying to bob and weave around. The game also features great music, audio, and for a 2004 game, it stands the test of time as far as visuals and presentation are concerned. Distinctly Japanese, and it's wonderful. Mushihimesama also features multiple modes to play, from time attack, novice mode, and even arranged mode. Though they all play fairly similar, does offer enough variability for people who are really into the meta of the game to find intriguing and worth exploring. So I've said plenty of praise for the game, and in my opinion, it deserves all of it, but what about the negatives? No game is perfect after all. Mushihimesama can be unstable at times. When it was originally launched, many people, including myself reported a crash on load. Luckily that's been patched out (mostly). I still experience crashes when I alt tab sometimes, but, they are very rare. The game also slows down when a lot of stuff is going on, and this is persistent no matter how amazing your PC is. The game can also be repetitive as well, since even with all the different game modes available it is the same content over and over again. You can finish the game first time through in about 20 minutes. Since the game is an arcade port, and in the arcade, the main punishment for failure is more quarters, that element doesn't translate as well when it's on PC. To be fair, Shumps are rarely about completing the game, and are made to be replayed. It's the points that matter when you're talking about the high end, and when you continue, it does reset your score to a degree. In the context of the genre, this is still a reasonable punishment for the player, though even with that said, does lose some of it's punch as a port outside of the arcade. Overall Mushihimesama is a fantastic shmup and if you're a fan of the genre, I have no hesitation to recommend it. If you are a more casual gamer, who's simply curious to the game, $20 might be perceived as high for a lot of recycled content, but even with that said, that content is about as solid of a shmup can ever hope to achieve.